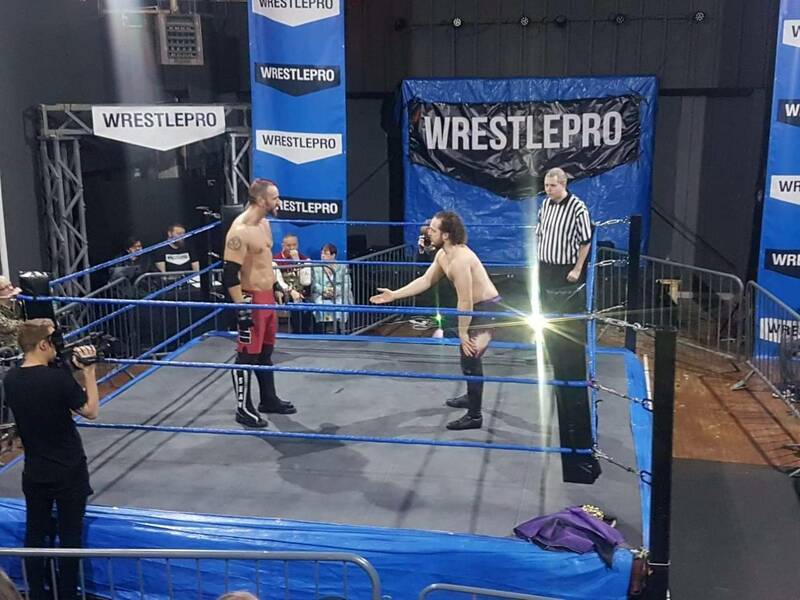 Hi everybody and welcome to another edition of Graps and Naps this time taking in Wrestlepro’s Next gen cup show and also in the interests of journalism some pubs on the way. 1st port of call and to meet up with fellow Graps and Claps contributor Andy Campbell was the Beatnixz brewery tap in the Northern Quarter of Manchester. 2/3rd’s of their own Riding east neipa at £4.40 was drank here and I can honestly say Im not a big fan of either the beer or indeed the tap itself although the toilets smell fantastic. Next up on our way through Salford was to the Salford Arms which has been reviewed before. A pint of Stockport brewery’s magnum mint choc porter was the call and was bob on costing £3.20 with your Camra card discount. Last, but no means least was the New Oxford which has a veritable feast for yours eyes as there must be at 20 taps and more Belgian beer than you can shake a stick at. Titanic chocolate and vanilla stout was had here at a cost of £3.70. A top pub and well recommended and well worth a visit. Drinks done it was of to the show so lets see what went down. 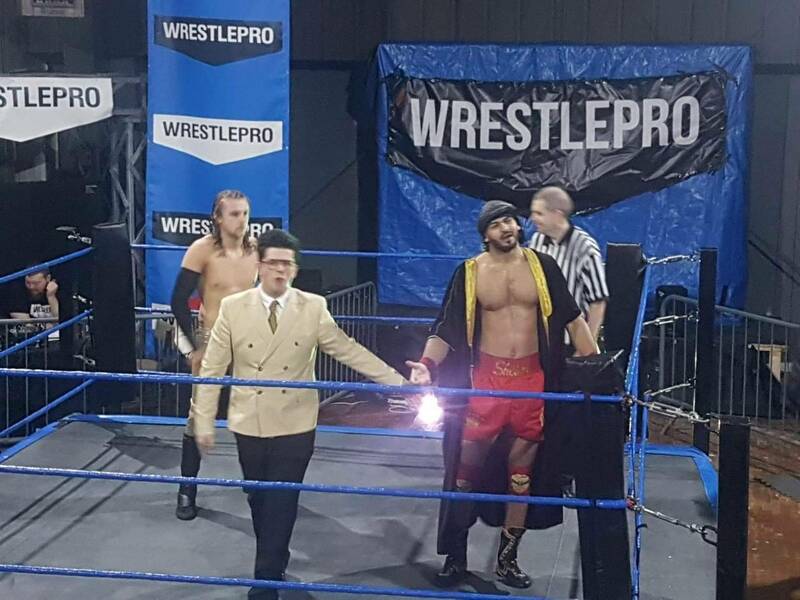 1st up the sirens came over the speakers which meant only one thing….It’s the Wrestlepro champ Crator and his manager Tom McManus. McManus proceeds to moan about Crator being champion for over 365 days and getting no credit. This brings out Stoxx to curtail the droning andshoehorn’s himself into a match by calling Crater a coward.Oooohhhh!!! Stoxx’s family are in attendance so whilst he is looking in their direction he’s blindsided by Crater who proceeds to give a beating. Stoxx manages to get away from the champ’s grip and delivers a crossbody, but to no avail as he’s caught in mid-air and given a bodyslam for his trouble. Again Crater’s on the attack with a massive beel throw into the corner. Stoxx comes back again with an enziguri to the champ and as before it comes to nothing as Crater gains the victory with an almighty chokeslam. 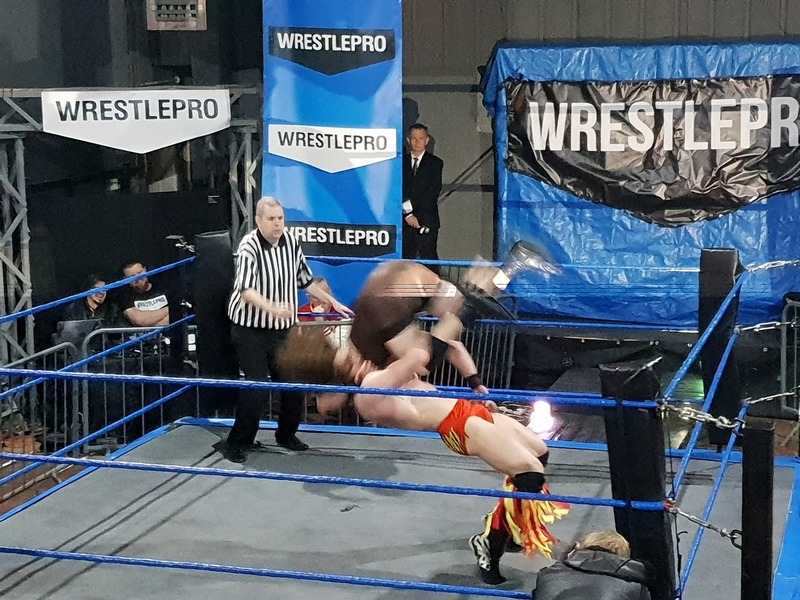 A comprehensive win for Crater as his reign over Wrestlepro continues. Next up is a first round match for the next gen cup between Sean Only and coming to the ring with his mystical book of yellow pages Isiah Quinn. Before the match starts Isiah is giving a spiel in the ring only for a young girl to shout out “you’re a freak!”. Chastised by the kid Quinn starts off with slapping Only in the face and gets a reciept with a flurry of kicks. Quinn makes a return by tripping up Only, stomping on his hand and then chokes him on the ropes. Only goes on the offensive with mores kicks and eventually gets a two count, but it’s Quinn who wins and advances by way of an implant ddt. 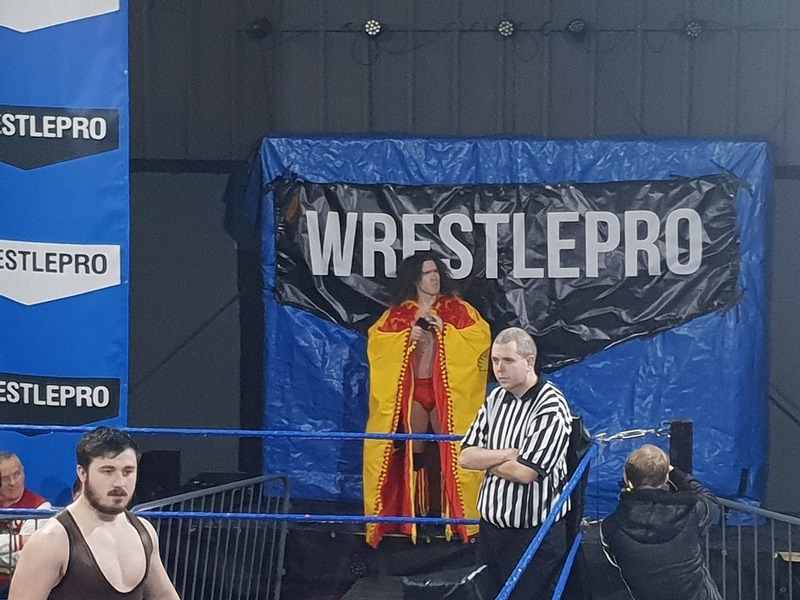 The Wrestlepro women’s championship is next on the line in a three way between Taonga, Rhio who was wearing new gear reminiscent of a Cadbury’s caramel wrapper and the champion Alexis Falcon who has a voice that can only be likened to an air raid siren. Falcon and Taonga team up and 1st choke then dropkick Rhio down. Rhio makes a return with a chinbreaker, but is taken down again this time with a double suplex. A miscommunication happens between the two antagonist’s and Rhio hits Taonga with a spear. Falcon then turns on Taonga with a kick. Rhio eventually manages to get both of her opponents on her shoulders and delivers a death valley driver. With Rhio’s back creasing the end comes when Alexis stunners Taonga and retains her title. Half time main event and it’s another Next gen cup 1st round match between Big Joe and “ Magnificent” Matt Brooks. Brooks comes out singing a re-jigged version of Queens radio ga ga.
“All we see is big joe is tiny” clap clap and the crowd got really into it. Joe gets extremely wound up with all the usual chants. The match starts of with a test of strength which goes badly for Joe as he ends up on his knees quite easily. Joe escapes, but ends up getting shoulder blocked and then flung out of the ring. Big Joe makes a comeback choking Brooks and then a slam. Brooks fires back with a bodyslam and then throws Joe into the corner for a singer splash followed by a pitch perfect plex which Joe kicks out of at two. Joe manages to hit both a flying uppercut and a sitdown splash both resulting in near falls. The end comes when the magnificent one hulks up and hits his patented big boot and legdrop for the win. Top character work from both guys who are a pleasure to watch week in week out. 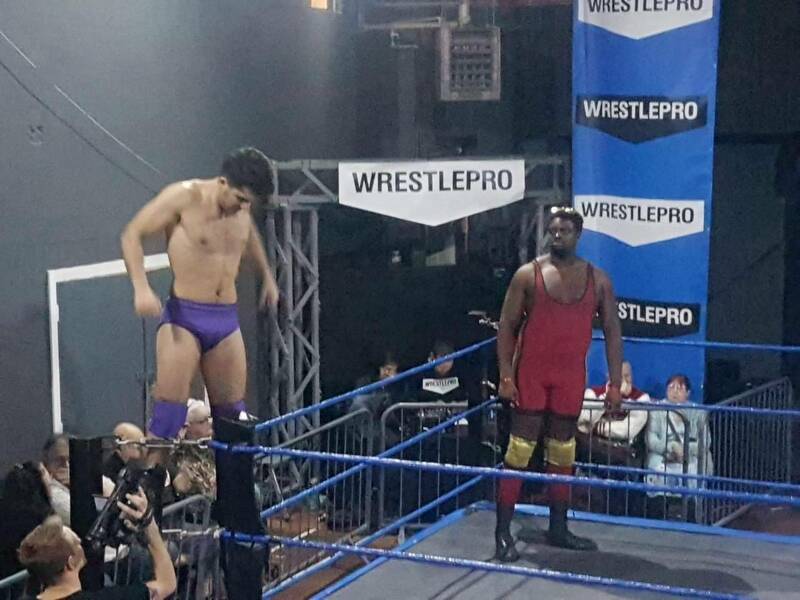 Half time refreshments of a bottle of coors at £2 done and it was onto the second half of the show with the third Next gen match pitting Soner Durson vs Big T Justice. Durson starts by trying to topple T but to no avail. The young girl in the crowd pipes up calling Big T a bully to which he replies “and your parents don’t love you”. The fight carries on outside and as the ref counts them both any young lad shouts “ you’re both gonna lose at this rate”. Smart to the business that lad. Back in the ring and T chops Soner and it sounded like a gun going off. This led to a nonchalant cover by T who begins to work Durson’s back over with two backbreakers and a bearhug. Soner manages to break free and hits a crossbody which is caught in mid air by Justice. The tide turns when Durson gets three corner dropkick’s and a ddt on Big T for a two count. Normal service is resumed as Big T gets the win by submisson with an over the shoulder back breaker which literally had Soner’s head touching his feet bent backwards. Check out @bigtjustice on twitter for the video as it’s one of the most wince inducing things ive ever seen. Eight man tag next with Thrift Avenue and Alex Boylin and Nick Maguire taking on the biscuit club and tag champs the swarm. Just a few highlights were all combatants fighting each other and watching the Biscuit clubs biscuit tin get used sending a tea time assortment all over the ring, and one of the members of Thrift Avenue using that deadliest of manoeuvres a chinese burn!! The end comes when Boylin and Maguire implant ddt’s Wasp for the win and possibly setting up a title match down the line. Main event time and it’s the last match in this round of the Next gen cup and it’s two of my personal northern graps favourites in Sheik el Sham(bles) and from the sandy beaches 😉 Callum Corrie. Classic mike work from Sheik to rile the crowd up which ends up with him being shoulder tackled and ground down with a headlock. 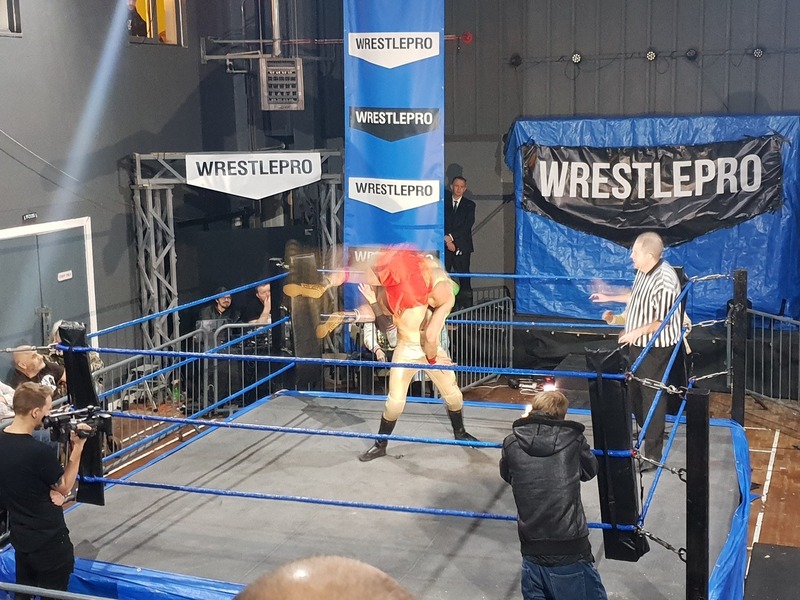 Crater’s manager Tom McManus appears from the back and creates a diversion for Corrie and this gives an opening for el Sham to score with a flying elbow. The beat down carries on with Sheikh posting Corrie and then raking his eyes. Callum comes back with a massive dropkick, but gets caught with a fallaway slam. Corrie comes back again with a lungblower for a two count and then goes to the corner only for McManus to get involved and push Callum off. This leads to El Sham hitting a tower of london and getting a near fall. Corrie recovers and goes for a dive, but hits the ref and knocks him loopy. This gives Crater the chance to interfere so whilst Sheikh holds Corrie, Crater runs at him with a clothesline which misses and hits Sheik.Oops. In the melee Callum gets the victory by cheeky roll up he moves on in the tournament. All in all a cracking show and well worth the £7 . Thanks for reading and I’ll see you later.